The Korea Amateur Baduk community has been festive with National Sports Festival, National Junior Sports Festival and National Baduk League along with newly established The 1st Korean Sport &Olympic Committee President Championship and The 1st Asian Female Baduk Tournament. Here are the top 10 Amateur Baduk news of 2017 selected by Korea Baduk Federation. The most significant news of 2017 is the successful promotion of Baduk tournaments in Korea. More than 6 big city-sponsored tournaments and other types of tournaments have been established in Korea. Recognized as a sport, sponsorship and interest of many cities in Korea to Baduk are expected to flourish continuously. The 1st Korean Sport & Olympic Committee President Championship was successfully held from October 28 to 29, 2017 at Seogwangsa Temple in South Chungcheong Province. A member sport of the National Sports Festival and a tournament sponsored by Korean Sport & Olympic Committee, Baduk is solidifying its presence as a sport in Korea. In May and October 2017, both National Junior Sports Festival and National Sports Fetival were held respectively for all representatives of 17 cities of Korea. 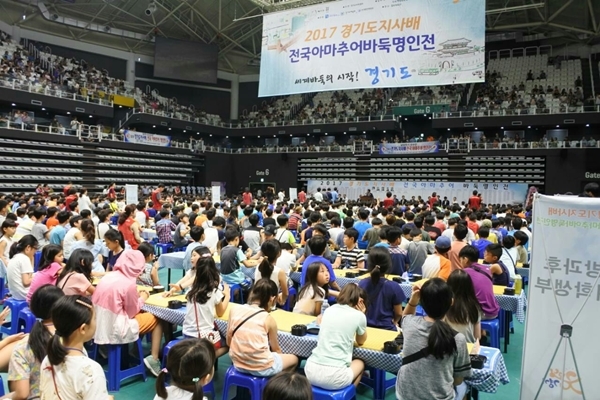 Baduk became a member sport of National Junior Sports Festival since 2015, and became a member sports of National Sports Festival since 2016. On December 19, 2017, Seoul Poorendol defeated Daegu Dukyoung by 3-2, winning Championship for two consecutive years. The Post Season MVP went to the Player, Kyungrae OH,and also the Head Coach CHAE received Head Coach Award for two consecutive years. Since the establishment of National Baduk League in 2012, Seoul Poorendol is the first and only team to win Championship for two consecutive years.In 2017 National Baduk League, total of 18 teams (2 groups with 9 teams)participated in Dream League and Magic League, and each team played 17 rounds. The 12th Korea Prime Minister Cup International Baduk Championship(KPMC) was held from September 9 to 15 in Buan. As the biggest Baduk tournament in the world,players from 55 countries (Asia 12, Europe 29, North America 11, Oceania 2,Africa 1) participated. Yikang ZHAO, the representative of China, won the Championship, winning all 6 rounds. Kwang-ho CHOI, the representative of Korea Republic, resulted in Third place. Since the first Championship held back in 2006, KPMC has been inviting numerous talented players around the world to help Baduk players to advance to the next level in Baduk and to promote Korea Republic and Korea Baduk to the world. The 1stAsian Female Baduk Tournament and Universal Baduk Chunhyang Contest were newly established in 2017 to make progress in Women's Baduk world. The 1st Asian Female Baduk Tournament took place in Youngam in November, and 50 players from 10 different countries participated. The Champion was China and KoreaRepublic resulted in Second. Also, in June, Universal Baduk Chunhyang Contesttook place in the originating city of Chunhyang, Namwon. The world ranking #1 female player, Suyoung Kim, won the Championship. Through these tournaments, we hope to make a significant progress in Women's Baduk. The Korea Baduk Federation has been chosen as the organization to run the ¡®Share Happiness: Sports Classes' by Korea Sport & Olympic Committee. In July, KBF have opened Baduk classes at 20 Community Child Centers. Each class is taught by 2 teachers and the KBF have provided Baduk textbooks and equipments. The classes are taught once a week for two hours for 20 weeks. On November 18 at the ¡®Share Happiness: Baduk Classes' tournament, total of 300 children from 12 Community Child Centers have joined. Starting in February 2017, the Korea Baduk Federation now issues Dan Certification for Amateur Players. Sungbong HA with the most wins from the World Championship and tournaments in Korea was the first to be approved officially as the Amateur 8 Dan. To popularize the Dan/Kyu system of Baduk, the KBF offer different levels of evaluation for adults and children via internet as well. Internet evaluation is determined by the matches with an Artificial Intelligence. The 2017 Baduk Night was held on December 9, 2017 at Legend Hotel in Daejeon, Korea. Not only Baduk Players, but also people who have dedicated to Baduk were awarded.Here are the list of people that were awarded the Grand Prize. Also, the Prizes were awarded to many branch offices and people who have made dedication to Baduk. In September 2017 at the Asia Go Federation General Meeting, the President of Korea Baduk Federation, Shin, Sang-chul, was elected as the President of Asia Go Federation. The former President Suh, Dae-won has been promoted to Honorary Chairman. The Asian Go Federation was founded in the year of 2006, and currently 14 countries and territories are registered as members. AGF is dedicated to connecting Asia as one community through the game of Go, and has been sponsoring the 1st Asian Female Baduk Tournament to promote Baduk more widely around the world.